You can sit back and take in more stunning scenery today as we journey by road to Jasper, a former railroad town. At this time of year its national park is described as a Christmas card come to life, with its snow-dusted evergreens and frozen waterfalls. You'll get to see it for yourself tomorrow. But for now, just relax and enjoy your hotel's facilities, or head into town to one of its many cosy bars or restaurants.​ Later this evening, you could join an optional excursion to Jasper's Dark Sky Planetarium and Telescope experience. You'll learn about astronomy in the dome theatre, and weather permitting, view the night sky from the outdoor viewing plateau whilst enjoying a hot chocolate and s'mores. It is home to abundant wildlife, shimmering glaciers, crystal-clear lakes, thundering waterfalls and evergreen forests. And all this is surrounded by rugged snow-capped mountain peaks. We'll take all these wonderful sights in before we embark on a thrilling winter adventure. In the company of a Local Guide we'll head off on an icewalk in the Maligne Canyon. As we head to the bottom of this deep gorge, we'll see frozen waterfalls, ice caves and incredible ice formations. 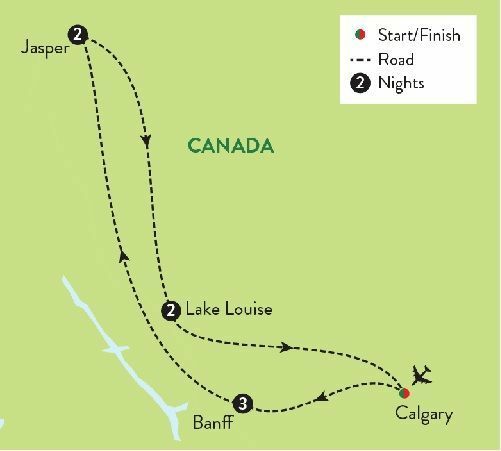 You'll also learn about the spectacular landscape of the Maligne Valley and hear tales about the mysterious 'disappearing' Medicine Lake. We'll transfer you to Calgary today, we will stop by Canada Olympic Park, where the bobsleigh and ski-jump events of the 1988 Winter Olympics were held. And there's time for a short city tour before we take you to the airport for your flight back home. Winter is truly magical in the Canadian Rockies when the lakes freeze, the mountain peaks are enveloped by snow and a pure white blanket covers the ground. Unforgettable experiences await as you explore Banff by horse-drawn, visit Jasper National Park and Lake Louise, before cosying up by the fireside to toast your winter wonderland adventures. Mount Royal Hotel, Banff Perfectly situated downtown in the very heart of Banff and overlooking the mountains, this historic hotel is in a redbrick building dating to 1908. Warm, relaxed rooms and suites have free WiFi, air conditioning, flat-screen TVs and sitting areas. Dining options include a Canadian restaurant with communal tables, a rib shack, and a cozy lounge with a fireplace. There''s also a hot tub and a sauna. Fairmont Chateaux, Lake Louise Steeped in history, this iconic hotel has sat on the shores of Lake Louise for over 100 years, surrounded by rugged mountains and the mighty Victoria Glacier. Originally a one-storey log cabin, the hotel has evolved over the years to become a luxurious mountain resort and your holiday includes a two-night stay here. Hotel facilities include a choice of restaurants and bars, spa and health club featuring indoor heated pool, whirlpool, steam room and fitness centre. The well-appointed guest bedrooms feature en-suite facilities, coffee-maker, kettle, hairdryer and TV.